When shooting macro pictures of flowers recently (see here), I found that the small tripod that I had could not hold the camera steady, and in fact I threw it away, as it was not good enough even to give away. My main tripod for routine use with less demanding lenses has also begun to be unreliable, with one leg slowly sagging under weight and another leg falling out when opening the tripod for use. I dis-assembled parts of it, tightened and reassembled, but the “service” did not last. I realised that after forty years of use, the nylon blocks that were used for locking had worn down. I do of course have the Berlebach UNI 14, which is reported on in detail here. It is superb for ultra-heavy and ultra-long lenses, such as the 1000mm Carl Zeiss Jena Spiegelobjektiv. However, it is not designed for working with the camera very near to ground level, and is rather bulky for taking on trips and routine use. So now the search was on for a new tripod. plus suitability for ultra-low shots (for instance, of flowers, not just looking down on them from above, but straight on from near ground level). It also needs to be reasonably small and light when packed up, so that it could be taken on trips with me, and possibly even in cabin luggage for air travel. with these massive degrees of magnification, the effects of any movement by the camera outfit will also be magnified, resulting in unsharp images or even what appear to be multiple images. 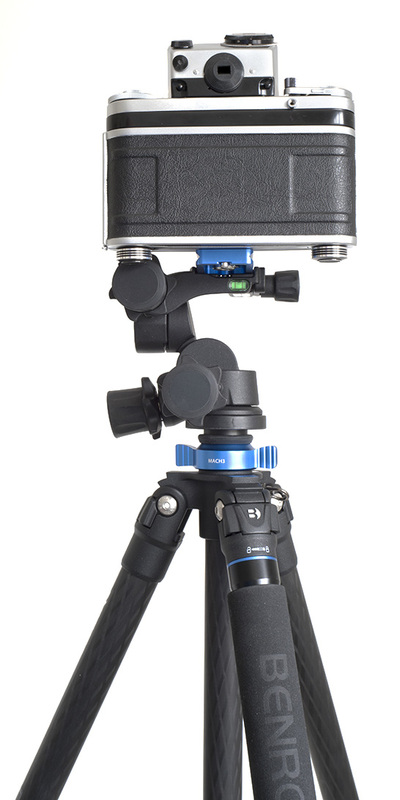 I have included here the Arca-Swiss B1-G ball head, as I already have this, so the total weight with that shows the load that a tripod must comfortably be able to bear without risk of movement. The weight on the previous line shows the load that a tripod head needs to support. Many reviews indicate that ball head manufacturers often make exaggerated claims for the loads that their products will support. However, the real test is not what the ball head will hold still when the weight is carefully and evenly distributed when the centre of gravity is right above the ball head, but what it will hold totally immobile when the outfit is tilted at an extreme angle – for instance, up, to shoot birds in flight or down, to shoot plants, butterflies, etc., all of which inevitably shifts the centre of gravity. 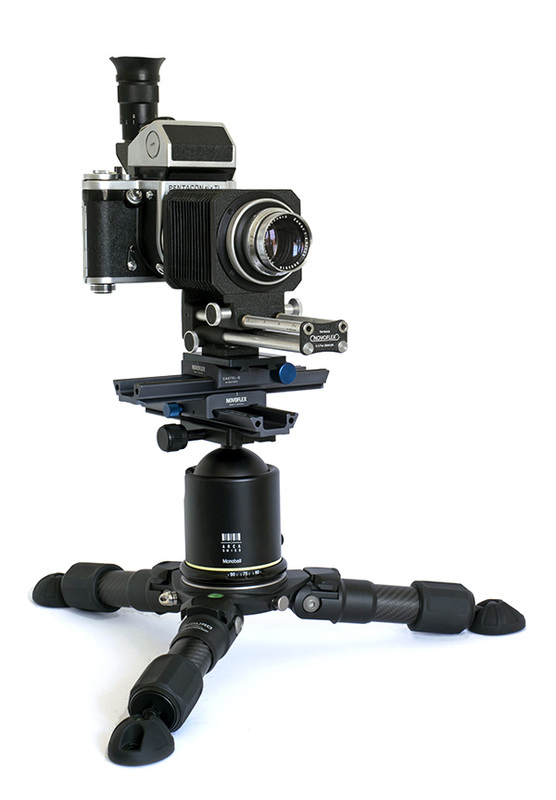 As with the Berlebach, I discovered that the more “serious” tripods do not come with any sort of head, so I would need to find a suitable head, which might be a pan-and-tilt head or a ball head. (Or there is another possibility – see near the bottom of this page, here.) Again, I do still have the superb Arca-Swiss B1-G ball head, which is also reported on here, but I may appreciate having a smaller, lighter head for some situations or trips. I looked at a friend’s tripod from a major European tripod brand, purchased a year or two ago, and discovered that carbon fibre tripods are a lot lighter than my 1970s aluminium tripod, but just as stable – or even more so. 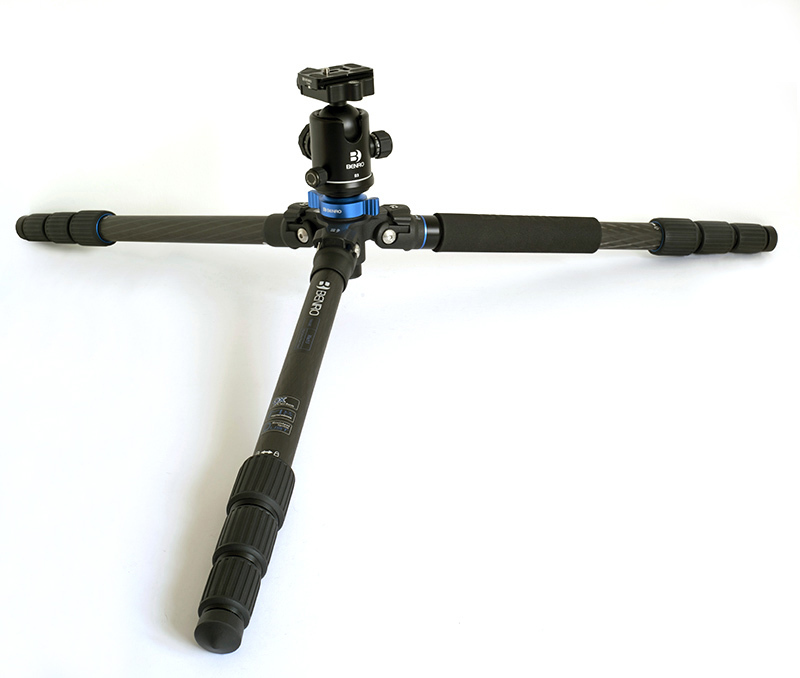 Some current ranges of tripods are available with a choice of carbon fibre or aluminium, with the carbon fibre ones being lighter and the aluminium ones being cheaper. One of the problems in getting near ground level with some tripods is that, no matter how far out the legs are splayed, the centre column eventually touches the ground and one can’t get any lower. Some tripods will take the camera upside-down at the base of the centre column, or by turning the column upside-down (see, for instance, here, near the bottom of the page). That may work fine in the studio, but is not very practical out “in the field”, especially if it is a real field, or a garden or park, or a shore with waves splashing nearby. After significant research on the internet, in March 2019 I was able to go to the annual Photography Show at the National Exhibition Centre near Birmingham (U.K.). Here I was able to see vast numbers of tripods from brands both famous and unknown. 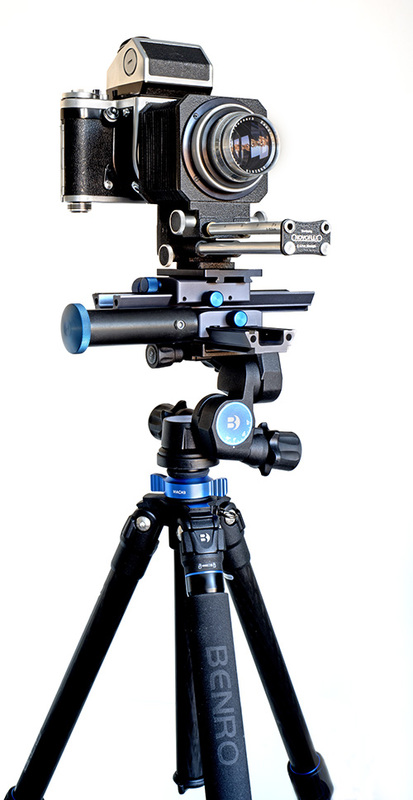 My on-line research had revealed that some, at least, of the Benro tripods (blue seems to be the company colour) were supplied with both a standard and a short centre column. This might be the solution. At the Mac Group Europe stand I was able to see a wide range of Benro tripods. Internet research had suggested that a tripod from the light-weight Benro “Travel Angel” range might be suitable, but I had taken a Pentacon Six with me, along with Novoflex bellows and the 150mm Schneider-Kreuznach Xenar lens (see here), and it was clear that something sturdier was required. 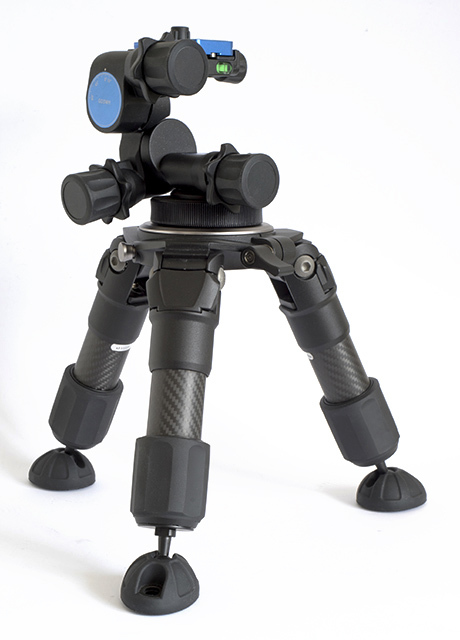 An extremely helpful Mac Group representative (Mark) recommended a tripod from the sturdier Benro Mach 3 range. As far as I could see, these were available in three sizes, the 28, 38 and 48, with the higher numbers indicating greater maximum height, and obviously an increase in weight and in the minimum folded size. The higher ranges towered above me – fine for a professional photographer with a small stepladder who wanted to set up behind a crowd, but not necessary for my requirements. I tried my outfit on a Benro TMA28C and it seemed spot-on, so I bought one from a retailer at the show. 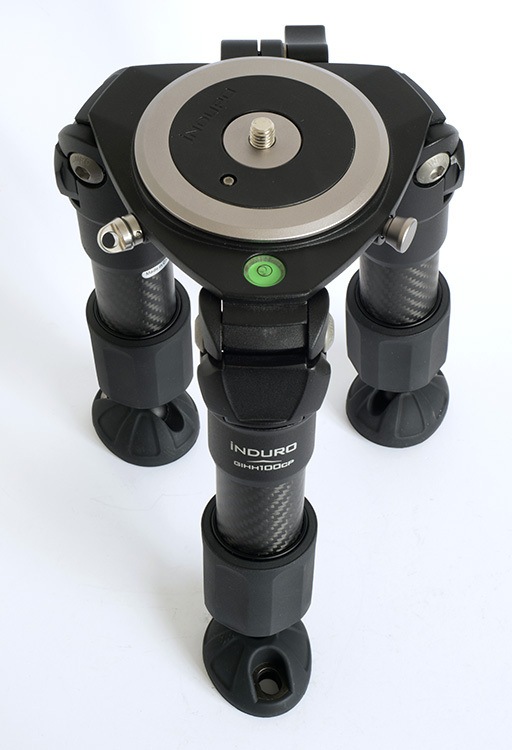 My internet research had also revealed a special low-level tripod, the Induro GIHH100CP, although I could only find them for sale in the U.S.A. It turns out that they are no longer distributed in the U.K., but I have been able to buy one and so report on it here. a Benro geared head, the GD3WH. The Benro Mach3 TMA28C comes well equipped with accessories. The Benro Mach3 TMA28 is supplied in a well-padded bag with two outer pockets. In this image we also see the instructions, the tool set and the short column, with its own cloth bag. These items fit well into the outer pockets. Inside the padded bag, we find that the tripod itself is inside its own cloth bag. We can thus put cable releases in the bag beside it, without any danger that they will scratch the tripod. Here the tripod can be seen with its long centre column in place. There is a hook on the bottom of the centre column, so that in windy conditions a bag or other heavy item can be hung underneath the tripod, to increase stability. The tripod bag, and the inner cloth bag, are long enough to hold the tripod with a head in place. 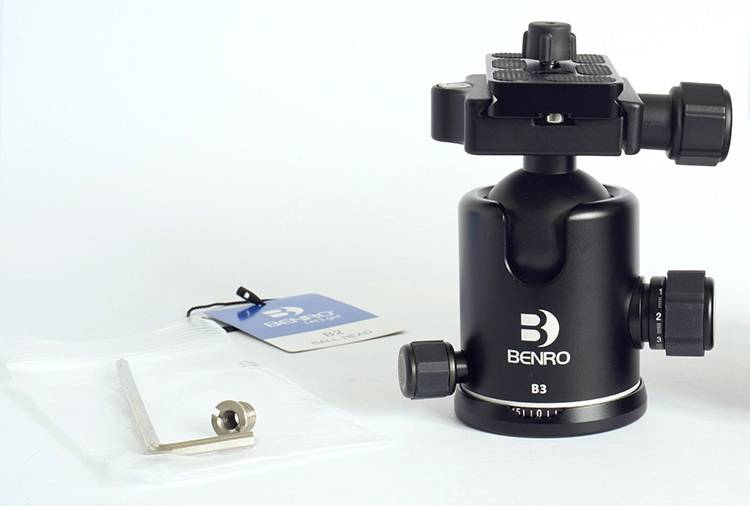 Here the Benro B3 ball head is shown on the tripod, and we have not included the cloth bag, to enable the contents to be seen. Not very obvious in the above pictures is the removable shoulder strap for the Benro tripod case. For the detailed specifications, see the table lower down on this page. 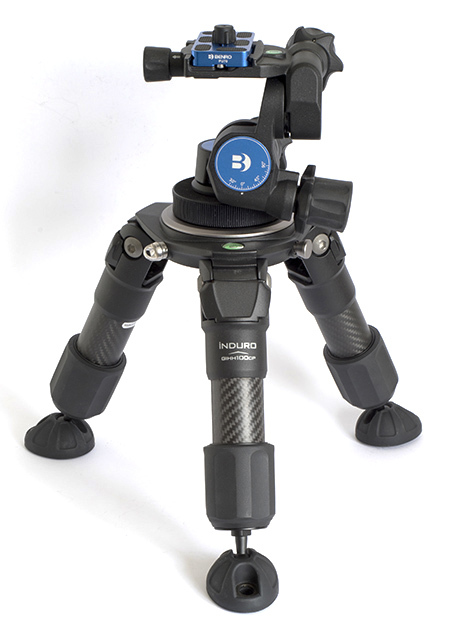 Like the Benro Mach3 tripod, the Induro comes well equipped with accessories. 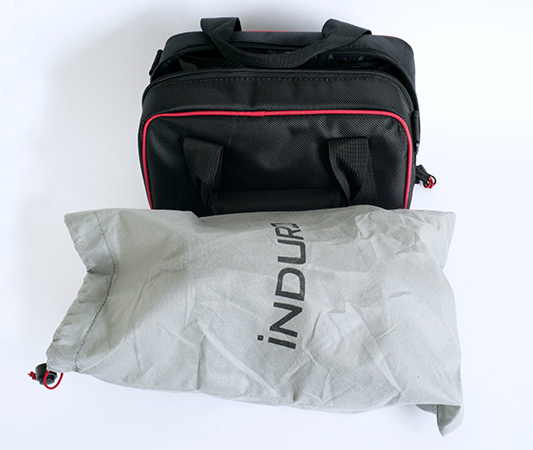 The Induro is supplied in a smart and compact padded bag and in their publicity the manufacturers point out that it can easily be part of cabin luggage on an aeroplane. For information on the pod feet, see below. We can thus put cable releases or other small accessories in the bag beside it, without any danger that they will scratch the tripod. 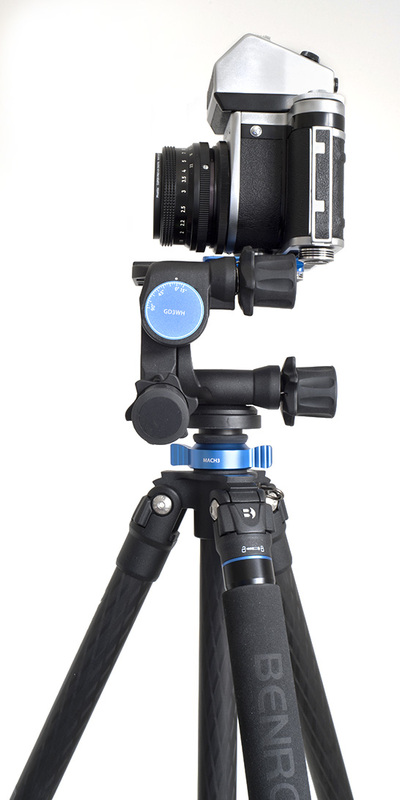 Here is the tripod, complete with its highly-adjustable pod feet that will swivel to any desired angle. The manufacturers state that they will take a firm hold on any surface and even suggest that they enable the tripod to be used on a car bonnet (American English “hood”?) without scratching it – although I will not be testing this on my car! Its “short, fat legs” are definitely “perfectly formed” (a reference that will be understood by U.K. fans of Morecambe and Wise!). They can be extended to approximately double the length that is visible here. This view from above shows the built-in bubble level, the approximately 100mm diameter top plate, with its 3/8" mount for a suitable head, and an alternative view of the pod feet, each of which has a hole so that the tripod can be bolted to a larger base if desired. The top plate can be rotated, or even removed and replaced with an alternative top. The manufacturers also offer a bowl-like plate with an equivalent bowl with a flat top that fits into it, enabling easy adjustment of angle. Videographers apparently call this top a “Hi Hat”. 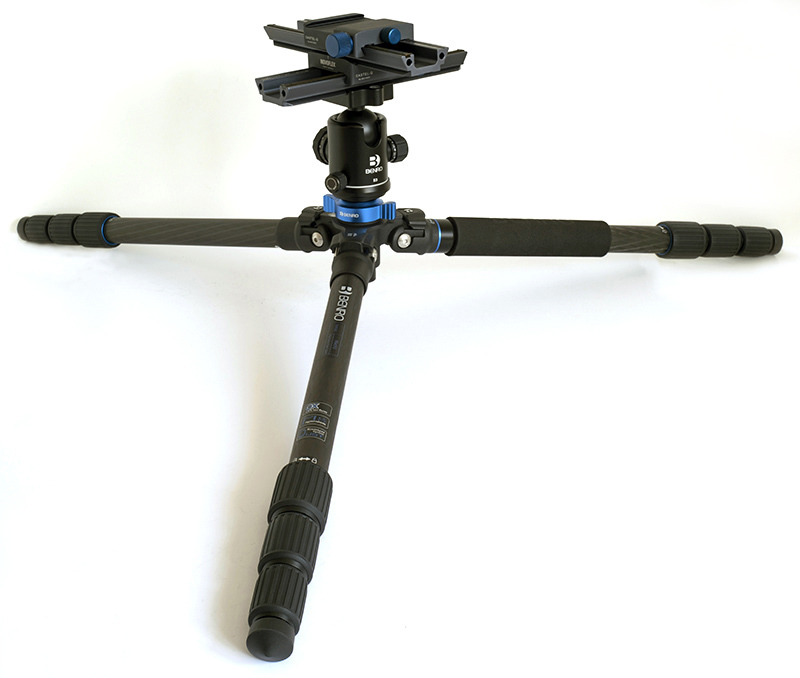 The similarities of style and design detail for these two tripods are quite remarkable, and the USA distributor of both of these brands of tripods states that they are manufactured in the same factory. (See the YouTube video on servicing the leg assemblies for these tripods here – last accessed on 31.3.19.) We also note that the box in which the Induro outfit was supplied bore the Benro name, logo and slogan on four sides. 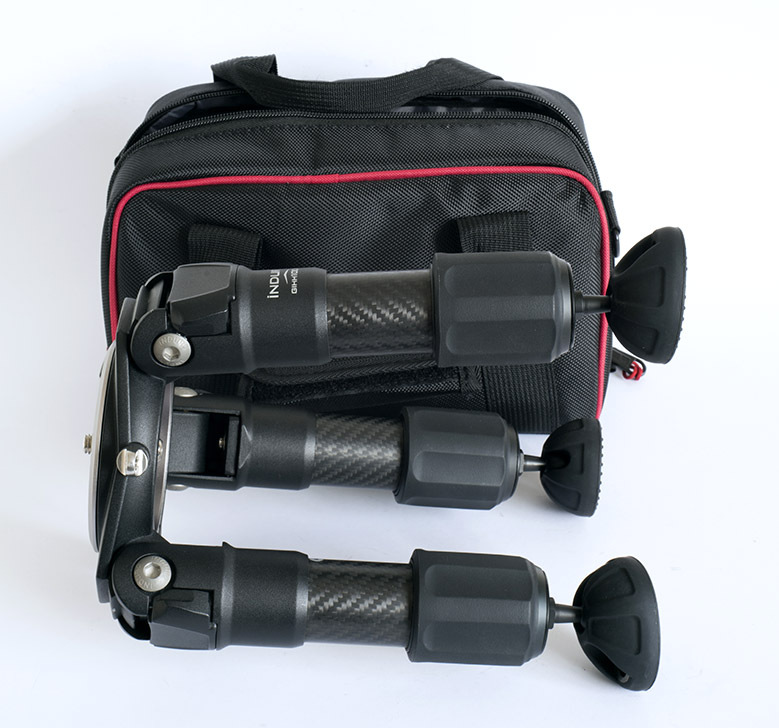 For the user of these two tripods, this does make usage quite intuitive when switching from one tripod to the other: for instance, the legs open, extend and tighten in exactly the same way with both models. For the detailed specifications, see the table below. Folded 53 cm / 20.87"
3/8" with adapter to ¼" included 3/8"
Yes, that really is a minimum working height of just seven point seven centimetres (77mm) for the Induro, not a typing error by me. I have measured it several times, as I thought that it couldn’t be that low, and that I must have made a measuring or transcribing error. The different sorts of feet should not make a significant difference to the working height, so I have not measured with them in place. 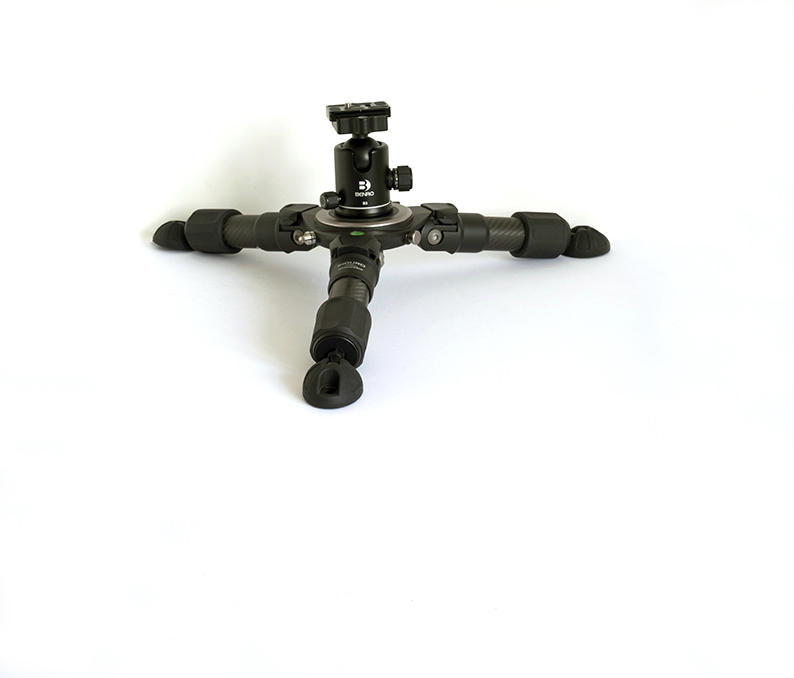 The Benro B3 Ball head is supplied with an Allen (hexagonal) key and a 3/8" to ¼"adapter bush, so that its 3/8" base can be mounted on a tripod with a ¼" attachment bolt. 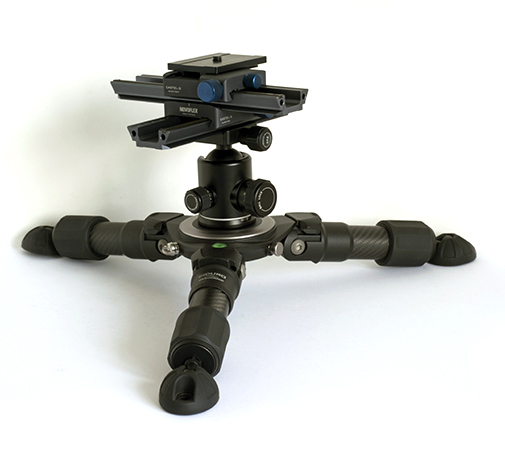 We note that the bolt on the top plate is protected for transit with a rubber cap (as are both of the centre columns for the Benro tripod described here). In this picture we see bottom centre of the ball head the degrees window for use when panning and bottom left the pan locking control. To the right of the ball head we can see the friction control wheel. The cut-out at the front of the B3 allows the head to rotate down a full 90°, to be able to turn a camera quickly from horizontal to vertical format – not a feature that we require with the Pentacon Six or other 6 × 6 cameras, but clearly useful for many other cameras. Rotating the unit, we can see the large ball-locking knob. Above it, near the top, is the locking knob for the “Quick Release” plate. 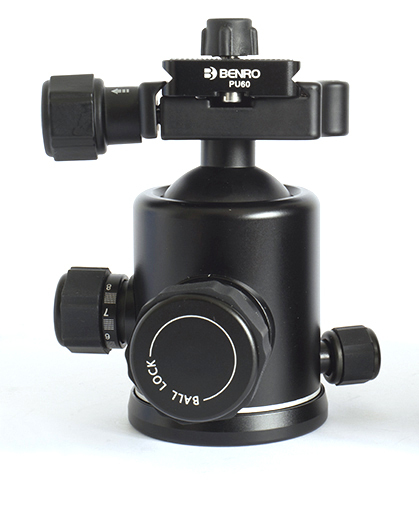 Benro supply their PU60 top plate with this ball head. The base for this plate is essentially Arca-Swiss compatible, although additional safety features make its operation slightly slower than with the original Arca-Swiss design. These features are designed to protect the camera by making it impossible for the mounting plate to slide out accidentally, and to prevent users from unintentionally loosening the plate locking screw too far. It would appear that many photographers look for such safety features when shopping for a ball head. When I bought the B1-G about ten years ago, it was supplied as seen here (in a strong cardboard box, of course). There were no accessories included and not even a quick-release plate. At the base here we see the degrees window that can be used to determine the exact angle when panning, of required. This is no longer a current model, but Arca-Swiss do still offer a range of premium-quality ball heads and accessories. at the top is the locking knob for the quick-release plate. On the base, in the far left in this picture, is the pan locking control knob. Just in front of it, from this angle, is the main ball lock knob and, recessed within it, the thumb knob for adjusting the friction. As one is likely to set the friction control only once for a given outfit, this system works well: there is no danger of accidentally loosening the friction when all one meant to do was to loosen the ball head lock. The friction control on any ball head is designed to prevent the head flopping over when the main lock is loosened, as it will hold the camera outfit steady, while loosening the main lock enables adjustment of the angle. Just visible to the right here is the cut-out in the base that allows the head to rotate down a full 90°, to turn a camera quickly from horizontal to vertical format (not required for the Pentacon Six, but undoubtedly a useful feature for many other cameras). For more pictures of the Arca-Swiss B1-G Monoball head and information on it, see here. 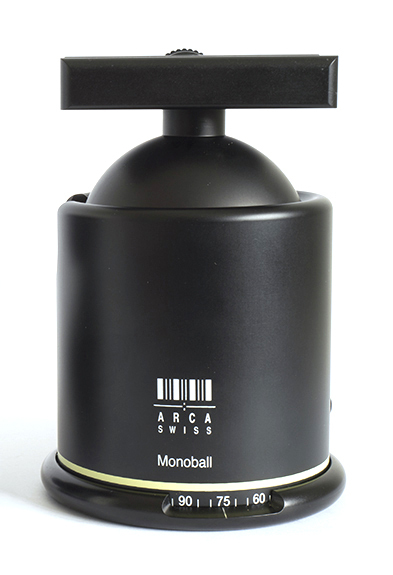 “For many years, the Arca-Swiss Monoball B1 Ball Head has been the standard by which all other ball heads are judged. Try one - you will quickly know why. 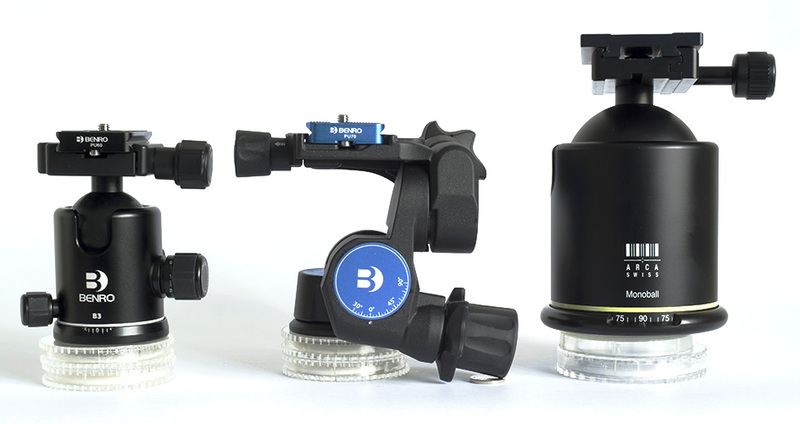 “Although not inexpensive, the Arca-Swiss Monoball B1 Ball Head delivers on quality. With the exception of a non-captive universal clamp thumbscrew (why not Arca?) - fit, finish and functionality of the B1 are exceptional. 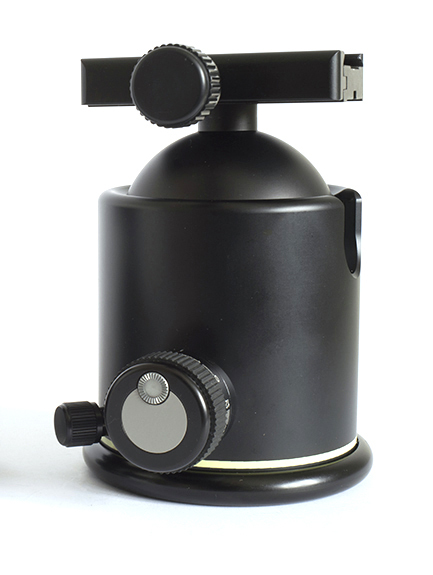 “One of the Arca-Swiss Monoball B1 Ball Head’s differentiators is that it is an aspherical ball head. As the load on the head is moved away from center, the effects of gravity increase. To offset the higher gravitational effect, tighter tension control is needed. Conventional ballheads require correcting tension control adjustments to be made. The Arca-Swiss Monoball B1 Ball Head, by virtue of its elliptical nature, automatically adjusts to handle the off-center load. The tension automatically gets tighter as you move the load off-center. And it works as advertised. Very nice. “Another nice feature is the indexed friction control knob. This allows you to know how tight/loose your Arca-Swiss Monoball B1 Ball Head is without having to test it. The 360 degree panning base is also indexed (helpful for panoramic shots). Here we can see the relative sizes of the Benro B3 and the Arca-Swiss B1-G. In this photograph we have removed the rubber protective cap from the top of the Benro PU60 plate and placed it on the left, and for the Arca-Swiss B1-G we have added a genuine Arca-Swiss “Quick-Release” plate. 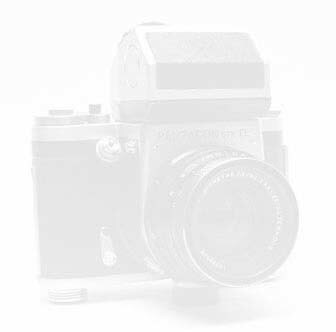 By slightly slackening off the top knob, this can be slid fully out, either forwards or backwards – possibly an advantage, but possibly also a risk, if we are not firmly holding the camera and lens that are mounted on the ball head. By contrast, when we look at the Benro PU60 “Quick-Release” plate, we can see on its underside a chrome protrusion or “button”. There is also one at the other end. This prevents the “QR” plate from sliding out. 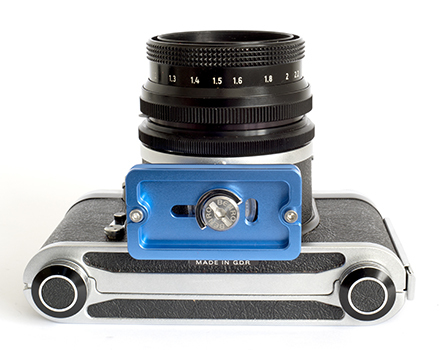 What is more, the QR plate locking knob has two positions: loosening it as far as it will go enables us to slide the plate backwards and forwards, to fine-tune focus or composition, for instance. To remove the plate completely, we must now pull on the locking knob, which will then allow us to turn it further and so create enough space to lift up the QR plate and remove it – a slower procedure, but no doubt a safer one. However, these studs do make this Benro plate unusable on top of the Novoflex Castel-Cross Q, described below, as it is not long enough for the studs to overlap both ends of the Novoflex Quick Release base. For the same reason, it will not be possible to use this Benro plate on top of the Quick Release base of the Arca-Swiss B1-G that is described here. Plates need to be bought separately. For non-low-down shots, the maximum height should be noted. When using the Benro Mach3 TMA28C with the Pentacon Six on the Benro B3 ball head, with the Novoflex Cross-Castell Q and the Novoflex bellows with their integrated focussing slide, the pentaprism eyepiece is way above eye height for me. (I am of reasonably common adult male height). However, if I extend one less leg section I can achieve perfect height, and further adjustment is possible by using the long centre column or slightly extending the legs further. 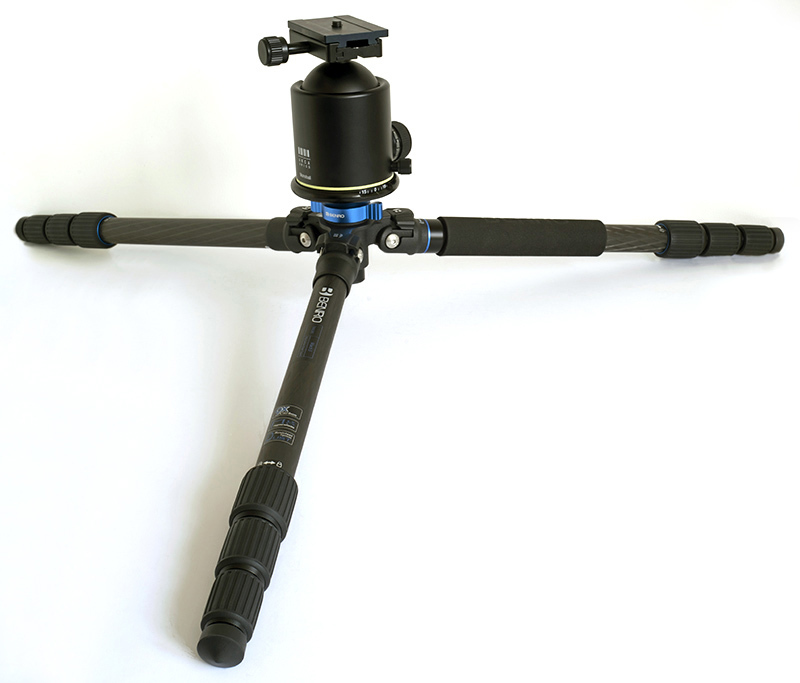 For a comparison of this tripod with the Berlebach UNI 14, see here (scroll down). The manufacturer’s specification states that the maximum height of the platform of the Induro is just 28.0 cm / 11", and one is likely to be on the lookout for exceptionally wide walls, steps, a convenient table, etc. for use at a normal, standing height. However, this is not the real purpose of this tripod, so it cannot be viewed as a limitation. What we are more interested in for this context is the minimum height. Both tripods have been photographed with each of the two heads, keeping the camera used for these pictures in exactly the same position for all of these four shots. I have not cropped out the surplus white space round the Induro, to make the relative sizes of the two tripods at their minimum height settings easy to see. Each ball head is fitted with a standard plate from the ball head manufacturer, the PU60 plate for the Benro and the 3/8" plate for the Arca-Swiss Monoball. Either ball head can be safely used with either tripod. 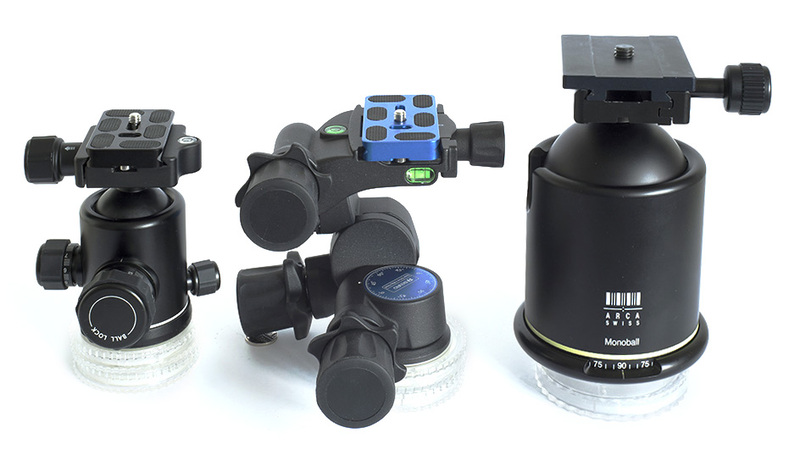 However, it is clear that B3 with its base diameter of approximately 58mm goes better than the large Arca-Swiss Monoball on the short centre column of the Benro tripod, with its platform diameter of 49mm. 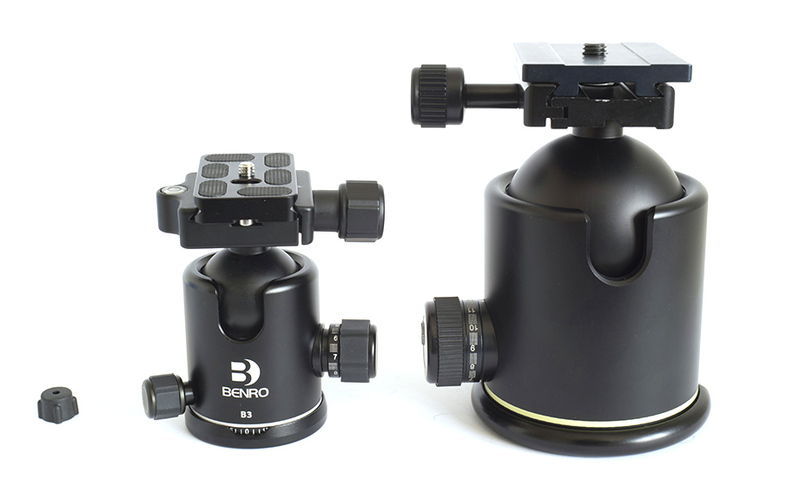 The B3 also goes well on the Benro long centre column, which has a platform diameter of 56mm. 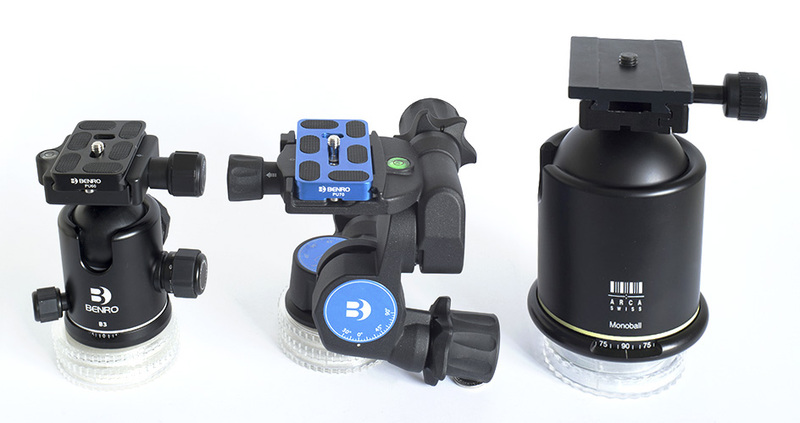 Likewise, the Arca-Swiss B1-G, with its 100mm base diameter, goes better than the Benro B3 ball head on the Induro, with its platform diameter of 100mm. The Arca-Swiss B1-G with its standard 3/8" plate is about 40mm taller than the Benro B3 with its standard PU60 plate. However, in spite of the greater height of the Monoball, the combined height with the Induro GIHH100CP is still significantly lower than the Benro TMA28C with the much smaller Benro B3 head. It is clear that when minimum height is required, the Induro is the tripod to use, even with the large Arca-Swiss monoball, and if we need to get a further 40mm nearer to the ground, then the Benro B3 ball head can be used on the Induro tripod. Next I show these two tripods with the Novoflex Castel-Cross-Q focussing and composition slides. I am here showing the Benro tripod only with the Benro B3 ball head, not the Arca-Swiss B1-G Monoball. 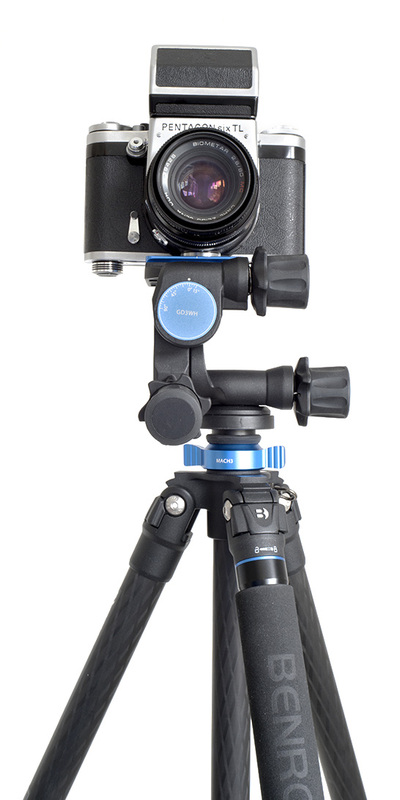 I show the Induro tripod with both ball heads. Again, all three images were taken from exactly the same position and I reproduce all of them at exactly the same size for the items shown, although with the Induro pictures I have this time cut out some of the surplus white area. Height measurements were taken with the Arca-Swiss 3/8" plate on top of the Castel-Cross-Q (even although it was not in place at the time that the photograph of the Benro tripod was taken). Every endeavour was made to keep the top plate horizontal, and measurements are accurate to within approximately + 1mm. Here we see the Pentacon Six with metering prism and angle finder to facilitate viewing the image (and metering!) when the camera is so near to the ground. On it is mounted the Novoflex TISBIG bellows with the Schneider-Kreuznach 180mm f/4.5 Xenar, via the TISXURRING adapter. They are mounted via an Arca-Swiss 3/8" Quick-Release plate onto the Novoflex Castel-Cross-Q focussing and composition slides, which are in turn mounted directly onto an Arca-Swiss B1-G Monoball head, which is attached to the Induro GIHH100CP tripod. Now we await a dry and sunny day, to try this out taking some low-level flower photographs. 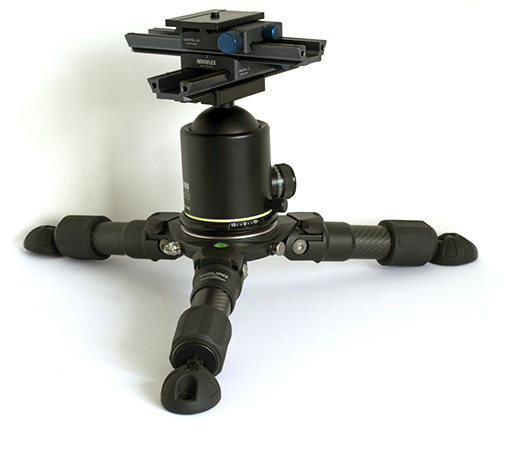 An alternative to a pan-and-tilt head (which is popular for filming or video) or a ball head is a Geared Head. Geared heads have a control knob for each axis: horizontal rotation (panning), up-down angle (tilt), left-right angle (to get the camera horizontal – or even vertical!) 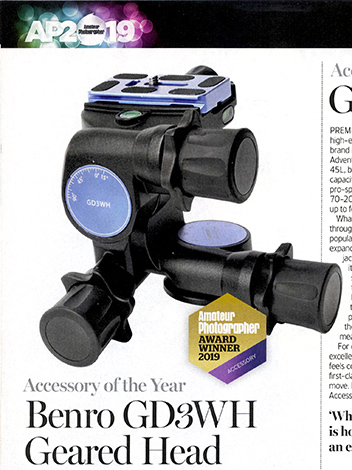 The “Accessory of the Year” in 2019 for the popular U.K. photographic magazine “Amateur Photographer” is the Benro Gear Drive 3-Way Head, known for short as the “GD3WH”, so after considerable on-line research I bought one from the U.K. retailer Wilkinson Cameras. They offered a competitive price and superbly-speedy dispatch, passing it to the carrier within minutes of my placing my order. Here I report on my initial experiences using this head with the Pentacon Six. As we are considering on this page how best to obtain low level shots, the first thing that we need to look at with this head is its height. To our surprise, even though it is clearly a lot bigger than the Benro B3 ball head, it is in fact, according to the specification, only 5mm taller than it. The maximum load for the GD3WH Geared Head is a lot less than for the B3 Ball Head, but still more than enough for my (demanding!) requirements. Here we can compare the heights of the three heads that we are examining on this page. The height of the GD3WH from its base that mounts on the tripod platform to the top of the supplied Benro PU70 camera-mounting plate is 11 cm, by my measurement. However, it is important to note that the lowest control knob of the GD3WH extends below the base of the head, and for this reason I have placed all three heads on filter boxes of equivalent thickness in some of these pictures. 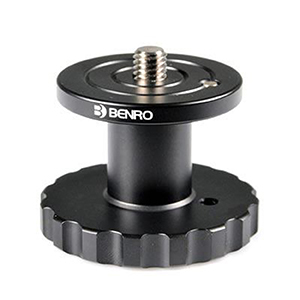 This low control knob may result in problems mounting the GD3WH on some tripods, and indeed Benro offer a spacer, to enable it to be mounted on such tripods. The specification for the spacer states: “For use with Benro GD3WH Geared Head, Size: 45mm, Weight (g) 15.” The “size” is presumably the diameter, and the height is not stated. Here are two further views of the GD3WH, along with the two ball heads, from a little higher up. A well as a better view of the top plates, we can see one of the three bubble levels in the GD3WH. In most circumstances, this is likely to be the “photographer’s eye” view of the GD3WH. We can also here see another of the bubble levels. Mounting the geared head onto the Benro Mach 3 TMA28 tripod with the long column, we can see that it fits perfectly, without any need for the spacer. It also fits perfectly with the short column. As we can see in the left-hand and middle photograph of the three pictures below, one of the Geared Head control knobs prevents me from sliding the Pentacon Six on the standard Benro PU70 “Quick Release” plate by more than a few millimeters into the QR holder, as the knob hits the left-hand spool knob at the bottom of the camera. The middle photograph below shows the same problem from a different angle. The QR plate is hardly engaged with the top of the Geared Head, the camera is unstable and is probably in danger of falling off the tripod. We have met this problem before, with the Manfrotto Telephoto Lens Support (Model No 293). That problem, and the solution that we found then, can be seen here. However, that particular solution wasn’t an option on this occasion. A spacer on top of the Head, below the camera, would solve the problem, or a Novoflex focussing slide (see above), but this time we rotated the QR plate through 90º, and then rotated the head through 90º, too. We were able to engage the whole of the QR plate by loosening completely the holder for the QR plate and lowering one side of the QR plate into it at an angle, then lowering the other side and tightening up the holder. The result can be seen in the right-hand photograph, above. The control knobs of the head are now in different (and slightly less convenient) positions in relation to the photographer, but this solution does work. Here we can see the Benro PU70 “QR” plate attached in a left-to-right orientation onto the bottom of the Pentacon Six. As an alternative, we could have used one of our very long “QR” plates. One of them can be seen here. Both the Benro Mach3 TMA28C and the Induro GIHH100CP are very solidly made and within a studio hold everything absolutely steady. 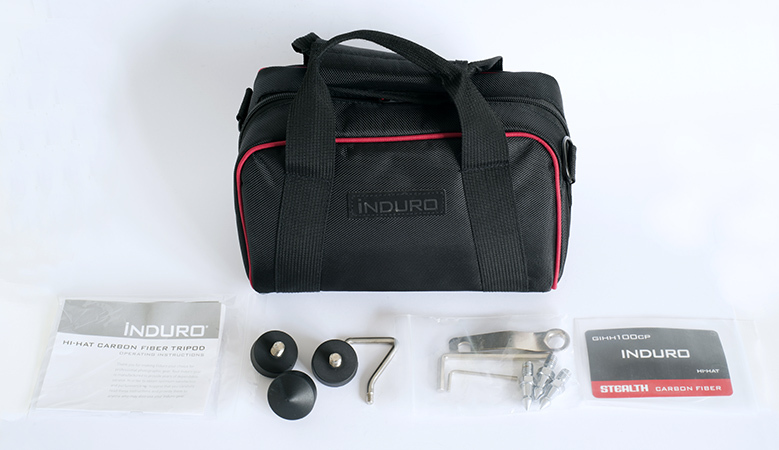 The Induro, with its bag, alternative feet and tools, will easily fit within cabin luggage for a flight. 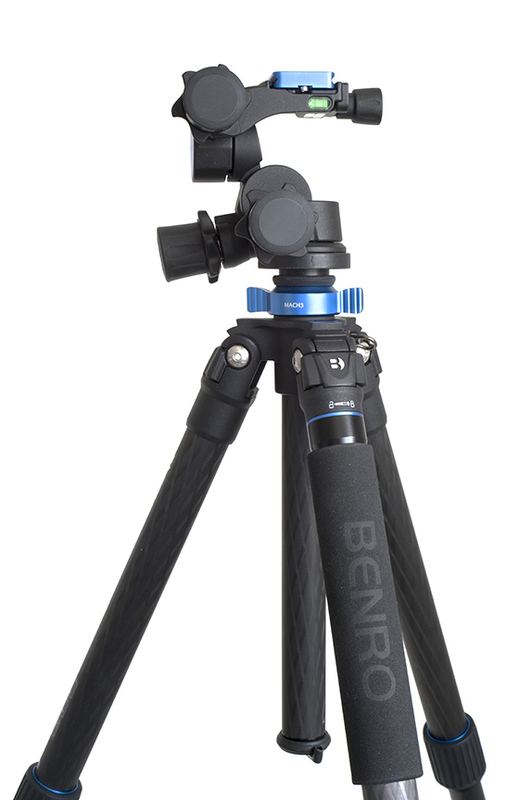 Like most tripods, the Benro is longer than I have seen permitted in cabin luggage, so it is likely to have to go in a suitcase or suitable bag in the hold. For a wide range of photographic requirements, including many low-level shots, the Benro is clearly the one to take. 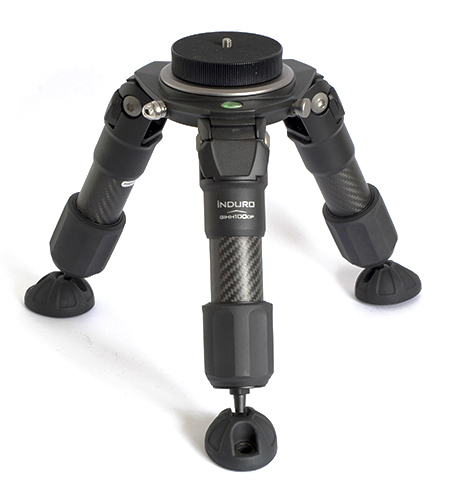 If one seeks the lowest-possible viewpoints and is prepared to do without a tripod of normal height, the Induro is the one to use. If one is travelling by car, one will probably pack both. Of the Benro heads tested here, both the B3 ball head and the GD3WH geared head are excellent. Taking close-up shots in a studio situation, the geared head is a delight to use, combined with focussing slides if this does not result in the camera being too high. Inevitably, the geared head will not fit into the Benro tripod bag, but this would not be desirable anyway, as the head could sustain damage in transit. It is best transported in its sturdy protective container, in the original box. In the picture to the right, by using the Novoflex Castel-Cross Q, I have raised the Pentacon Six up and it is no longer near the top controls of the Benro Geared Head. For this picture I have also added the Novoflex Fine Adjustment Handle for Castel-Q. It is the long straight tube that projects horizontally from the Castel-Q, on the left in this photograph. It makes precise adjustments of distance from the subject easier to achieve. Unfortunately, it is not possible to mount this head directly onto the Induro GIHH100CP low-level tripod, as the 100mm wide top platform of the Induro fouls two of the geared head controls. We could solve the problem with the above spacer, but that will add unknown extra centimetres to the height in a situation where we would like to get as low as possible. But there are other possible solutions. For instance, the Berlebach 3/8" to ¼" adapter (featured at the bottom of the page here) has a diameter of 8 cm and a height of just 17mm. 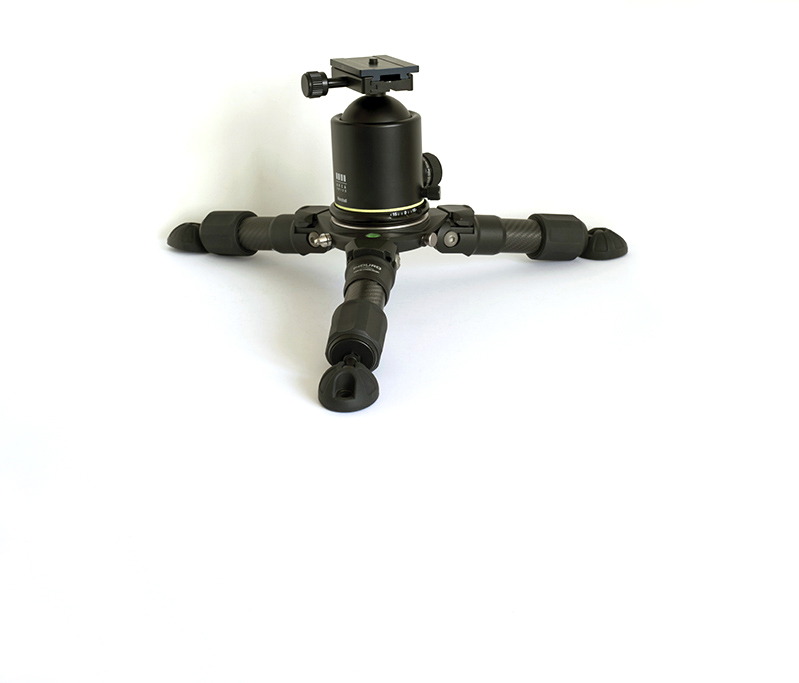 With its 3/8" socket on the base, it can be screwed straight onto the Induro platform, and the reduction in platform diameter plus the modest increase in height means that all of the GD3WH controls clear the adapter and the tripod and are easy to use. Of course, using this adapter introduces another problem: at its top it has a ¼" bolt, whereas the GD3WH has a 3/8" socket. However, the Benro B3 ball head (but not the GD3WH) is supplied with a ¼" to 3/8" adapter bush, which we can screw into the bottom of the GD3WH. Problem solved! These adapters are generally easy to source, in any case. They are reported on here (scroll down). This alternative view shows that all of the geared head controls clear the adapter. Here we can see a Pentacon Six mounted onto the Benro GD3WH geared head – again obviously with the Benro PU70 “QR” plate mounted left-to-right onto the base of the camera, to prevent the clash between one of the camera film spool knobs and one of the geared head controls. I have been very favourably impressed by the support of the UK office of Mac Group Europe Ltd, who distribute Benro products (see them for instance here). The results of tests, once taken and processed, will appear at the bottom of this page. To go back to the index page for accessories, click here. To go to the beginning of the lenses section, click here.